"Why You Should Consider React Native For Your Next Mobile Application Development"
"3 Ways You Can Benefit From Business Intelligence In Your Business"
Cloud computing is an emerging technology paradigm in today’s digital world. The tangible and intangible benefits that businesses stand to gain for strategic initiatives and innovation by adopting cloud computing technology is endless. For enterprises, adoption of cloud computing is a strategic decision for running infrastructure on the cloud by freeing up critical IT resources, to achieve tremendous cost-savings and cease revenue growth. Many enterprises are moving their technology ecosystem to cloud in order to harness the power and benefits of cloud computing. It’s mainly because of the significant advantages to the corporate growth with the opportunity for increased efficiency, improved cash flow and offers many more benefit. Before making your passage just because everyone else is doing, Let’s look at the 5 benefits you will reap by shifting your infrastructure to the cloud. One of the most important reasons for organizations to shift their focus to cloud computing is the flexibility in cloud platform, which helps to meet the business demands. Most cloud providers are extremely reliable in meeting the bandwidth requirement of the organizations as well as maintaining 99.99% uptime. It allows businesses to connect from anywhere, as long as they have a stable internet connection, enabling businesses to deliver project and troubleshoot issues without any delay. By shifting your enterprise solutions to cloud platform ensures top level security due to strict ISO security standards that cloud providers must adhere to, in addition to the regular security audits. This ensures no more worries about confidential data and treacherous hacking threats, as cloud computing gives greater security. In cloud computing your data is stored in the cloud, which could be accessed irrespective of what happens to your machine. You can even remotely wipe data from lost laptops, so that it doesn’t get into the wrong hands. Also the data is encrypted and transmitted between systems and applications, ensuring information is completely protected. Instead of conventional solutions, cloud computing can adapt to market conditions and allows the business to refine their existing venture and advance its level of efficiency. Cloud computing is flexible to meet the demand depending on the user request and thereby it eliminates the over-provisioning or IT systems overload. It increases productivity, helps in streamlining processes and improves the workflow. It allows employees to synchronize their files and shared apps instantly and simultaneously. Also cloud computing let you track your associates and their work, which further helps you to receive real-time updates. Cloud applications improve collaboration by allowing dispersed groups of people to meet virtually and easily share information in real time and via shared storage. This capability can reduce time-to-market and improve product development and customer service. Cloud computing can make updates in real time to increases collaboration and eliminate unnecessary duplications or generation of multiple versions of the same document. Also enables your team to access, edit and share documents anytime, from anywhere, to do it better. 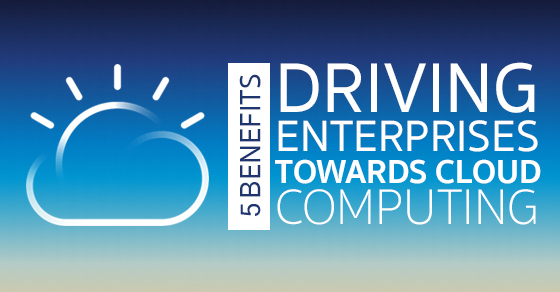 Its pay-as-you-go model, cloud computing minimizes costs without compromising performance. In spite of spending a large amount capital expenditure, cloud enables to leverage the power and performance of enterprise-grade IT infrastructure by maintaining your own hardware. Cloud services are much faster to deploy and you can predict the ongoing operating expenses. Rather than spending millions upfront without any ROI in data centre, cloud computing allows business to start projects faster and complete them.